In the busy world of greyhound adoption today—coordinating adoption days with the track, transporters and volunteers, scheduling and holding Meet and Greets, following up on medical questions from fosters and recent adopters, and the various other responsibilities involved in moving a retired racer from track to couch—it is hard to remember there was a time when adoption groups had to persuade industry insiders that these supreme athletes would make good pets and should be released to pursue a new life after their racing careers ended. 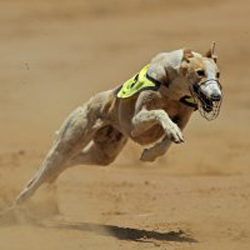 In the mid-to-late 1980’s, thanks to the explosion of the media spotlight on the racing industry and the advocacy of adoption groups now expanding across the U.S., more greyhounds were seen on the end of a leash walking along a sidewalk and not just in news clips showing them on a racetrack wearing a muzzle. Now, the focus was moving to adopting the retired racers rather than ending their lives when their careers were finished. 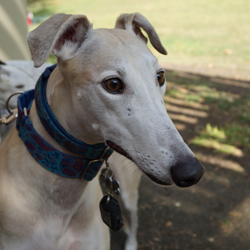 The first American greyhound adoption organization, Retired Greyhounds as Pets (REGAP), formed in 1982 and went on to expand across the U.S. over the next few years. By 1987, several of these groups united to create Greyhound Pets of America, which currently has almost 50 chapters across most of the U.S. and Canada. In addition to GPA, there are now many independent greyhound adoption groups, like GreySave, that find homes for retiring hounds. 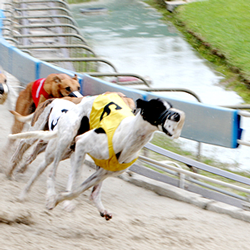 The American Greyhound Council (AGC), a racing industry organization, estimates that since the early 1990’s, more than 280,000 greyhounds have been adopted as pets. 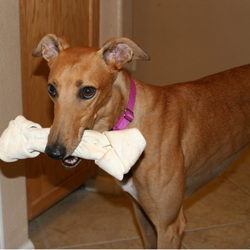 AGC also estimates that in current years, up to 90% of registered greyhounds are adopted. Most adoption groups do not limit their intake to “healthy, retiring racers”, either. GreySave, for example, took in 22 broken-leg or medical-issue dogs (19% of our total retirees)… just in 2014. Additionally, each “special needs” dog costs the group about 4x more in medical costs than a healthy retiree. A quick review of the adoption groups across the country will show similar statistics, mostly depending on the proximity of that group to a local track. Use foster homes (all volunteers), who take dogs directly from the kennels into their homes and teach them the basics of house-training, stairs, glass doors/windows, doorbells, etc. 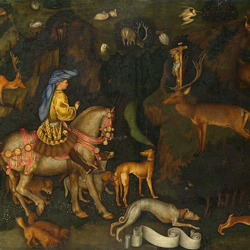 The last model is what GreySave uses for their greyhounds. This model gives us the most information about a dog’s personality and helps us find the best home environment for each retiree. It is also the most labor-intensive, as the number of dogs retiring depends entirely on the number of foster homes available. Most groups require a rather laborious process prior to adoption. After all, they are now responsible for the long-term well-being of this hound, and they want to make sure that any adopter receiving one of their retirees takes this as seriously as they do. At minimum, this usually requires an application and a phone interview. With GreySave, it also requires a Home Visit with one of our volunteer Adoption Representatives who has spent hours with other Representatives learning how to determine what home measures will help a hound successfully retire and grow to a happy old age.